Master the art of tempura at a professional cooking studio during a 2.5-hour class. 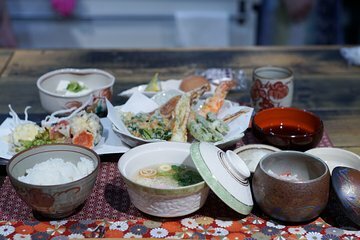 Get a hands-on experience as you learn the history of tempura, and understand the steps to making dashi (traditional fish stock), which is used as a base for soup and dipping sauce. Presentation is important in Japanese culture, so learn to set and garnish your dishes in an artful way, then enjoy your meal. Choose to pair drinks with your meal for an additional cost.